Our proudest and finest hamper at Prestige Hampers. Filled with only the very finest artisan and gourmet produces. This hamper is certainly suited for the Royal Family. 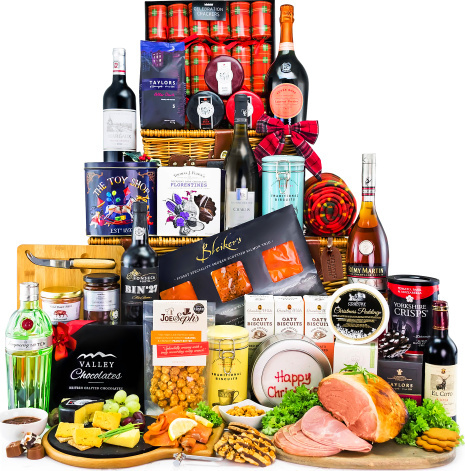 With the finest wines, most famous Belgian chocolates, world class champagne, award winning ham and signature cheeses, this is a hamper never to be forgotten. Complete with evening spirits, Scotlands' finest smoked Salmon by Bleikers topped of with luxury crackers for the whole family, this hamper will make Christmas one to be remembered. Ham and cheese cutter board shown for illustration.